Theater in the Now: Theater in the Now's Best of 2015! Theater in the Now's Best of 2015! 2015 was the year that theater went for it. Between the hip-hop mega-hit Hamilton to Fun Home, a daring musical based on a graphic novel, risks were taken and for many, they paid off. With many shows having an Off Broadway life and transferring to the Great White Way, there were still some big hits Off Broadway and the Indie world. Here's my list of favorites in 2015! 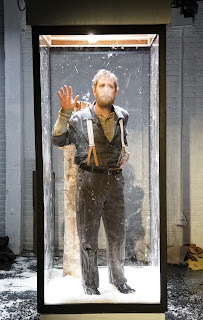 Deaf West revived the Duncan Sheik-Steven Sater musical in near perfect fashion. 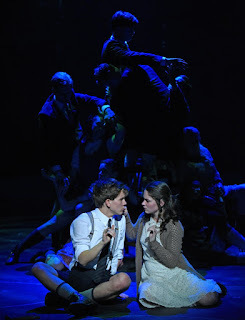 With a fresh-faced cast taking the helm, this production of Spring Awakening highlighted the words of the musical by blending voice and ASL seamlessly. Who knew that a revival could top the original production. Spring Awakening may have been lost in the landscape of Hamilton and Fun Home but it deserves to be recognized for how all-around strong it is. NYMF 2015 was filled with some potential future hits and some big duds. But there was one show in particular that defined the future of musical theater. That show was Songs for the Fallen. Written by Basil Hogios and Sheridan Harbridge, the musical is a bawdy, baroque, cabaret biography about Marie Duplessis. With Harbridge as Duplesses, Songs for the Fallen may be her star vehicle. Bringing a modern, electronic vibe and marrying it with a classical touch, Songs for the Fallen could very well be the female diva's Hedwig and the Angry Inch. Keep your eyes peeled for the future of this one. Sometimes theater hits home. And that was certainly the case with Josh Harmon's Significant Other. A play about a twentysomethings tireless search to find love in a sea of in-love friends, Significant Other will make you feel as if Harmon ripped your life from you and presented it onstage. 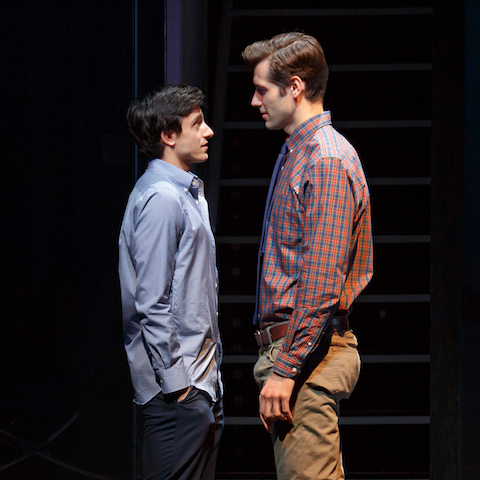 The Off Broadway hit was rightly extended and will likely have a long regional life, but the significance of this production was the stellar leading performance from Gideon Glick. Immersive theater is here to stay. And The Tower is defining why. Presented by AntiMatter Productions at HERE Arts Center, this sensory adventure with the Donner Party is everything immersive experience should be. Director Philip Gates and his extraordinary team transformed the space into a hauntingly magical Donner Lake where the past and present collide. Young artists who want to tackle the immersive world will need to strive to reach the glory of this production. After debuting as part of The Flea's #serials series, the Kapow-i gang took their show on the road and brought it to comedy and improv mecca The PIT for an extended run. Broken into three parts and nine episodes, this laugh-from-the-gut comedy offers a unique spin to anime, video games, and the who geek nation. Created by mad genius Matt Cox, Kapow-i GoGo proves that when you're making theater with your friends, a lot of heart goes a long way.